Well, the Texas/ OU game is done for another year. Texas claimed a victory at 16-13. I'll be curious to review the statistics later, and I am sure fans will have differing opinions as to what the game meant. Whether its due to having an offense that can't run a pass play, or Greg Davis going senile, UT ran play after play aimed at passing for only a few yards. This included when UT would earn yet another penalty or sack and wind up with 20 yards between themselves and a first down. The issue with running these short routes seemed to be that OU anticipated every route, meaning that our receivers could never truly get open, or do much more than wind right back up at the line of scrimmage. At any rate, UT's passing game is looking a bit sad compared ot last year. If you give the ball to Fozzy every play, they will figure it out. Greg Davis, it seems you are letting the kids with whom I played backyard football circa 1982 design your "trick" plays. They don't work, they make Colt look unhappy. Stop it. For a game that, at last check, wound up with 215 yards in penalties, I didn't think the refs were particularly whistle-happy. Whatever thought might have once been a part of football that meant "just let them play" has been scrapped, but apparently nobody notified Texas's line, who had multiple holding calls, costing us 5-10 yards on what seemed to be a play per drive (at least), and which injured almost every opportunity Texas had all game to move the ball. OU was responsible for what had to have been an equal or greater number of penalties, leading to UT's victory, as UT moved the ball almost entirely off of penalties during some drives. Played very well. Aside from a few mistakes, which are just inevitable, I don't think I've seen those guys play this well all year. If they can keep that up, its going to help make up for the weak offensive line, and whatever is going on with the 5 yard offense. 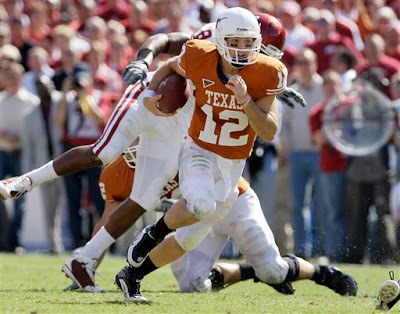 It's hard to tell if Colt McCoy is struggling, or if he simply has no help. In the first half, the line was offering him no time to find a receiver, but whether the receiver was open or not, he wasn't able to make much happen until he decided to start running. Unless he's a threat to do more than pass, it seems like the opposing defense isn't having too hard of a time shutting Colt down and/ or sacking McCoy. Look, OU didn't look any better than UT. At least not after Bradford went down with an injury early on. I am of the opinion that, had Sam remained healthy, UT would have gone down in flames. I am happy that UT won. I'm just not impressed at all with how UT's offense played. I like a "W" as much as the next guy, but as this isn't as straightforward playoff situation, and this widely-televised game is going to be considered by voters, how the game was played is an issue. The bottom line is that UT hasn't had a game where they looked terrific this season, and I remember laughing out loud along with everyone else when I saw the cream-puff schedule Mack brown got for his team. When UT won the Rose Bowl and took the 2005 Championship, part of what made the year so amazing was that expectations were not for a championship, UT had a rigorous schedule, and right up til the week of the game, ESPN (who is always looking at Pete Carroll with dewy eyes) didn't think UT stood a chance. Getting a soft schedule and looking bad when you win those games doesn't make the ranking feel terribly legit. There's a lot of season left yet for the Horns to either make it or break it. UT fans have a reputation, I guess, for being fair weather fans because of the nature of the fan base to be critical. Yes, its easier to be a fan when they are winning and playing well. But find me a UT fan who doesn't find a reason to complain about Greg Davis once per game, and I'll show you someone who doesn't watch the games and care. A truly great Texas team is still fresh in the minds of many UT fans, and, unfortunately for the team, every play is compared a bit with WWVYD? And, of course, the knowledge that when you're on top and there's this much season left, there's nowhere to go but down. I, personally, don't want to see UT wind up in another Texas or Alamo Bowl. And certainly don't want to see another team we've beat wind up ahead of us in the rankings once again. Let's all also hope Sam and other injured players get healthy soon. The weird false start penalties were upsetting. For a disciplined line, they should never happen. Just look at the snap, dummy! Was glad to see the designed runs. In addition to all the other Greg Davis failings you mentioned. Until this game, he seemed to have forgotten that Colt can run the ball. That said, Colt needs to remember not to try to do too much. Struggling for extra yards on a run near the OU end zone? They're going to stand him up and strip the ball. Earl Cambell / Ricky Williams, hr ain't. Yeah, Colt needs to be careful. He's a bigger guy now than when he was a freshman, but after today's stripped ball, its a reminder he isn't ready to move to running back.